[dropcap]S[/dropcap]ince S began full-day kindergarten in September she’s been waking up every morning eager to get back to school, and little wonder when she’s got such interesting stuff going down! While parents dusted themselves down and gathered their wits after the madness of the summer holidays, the kindergarten classes in this Canadian classroom were raising butterflies, learning about their life cycle, food and habitat. 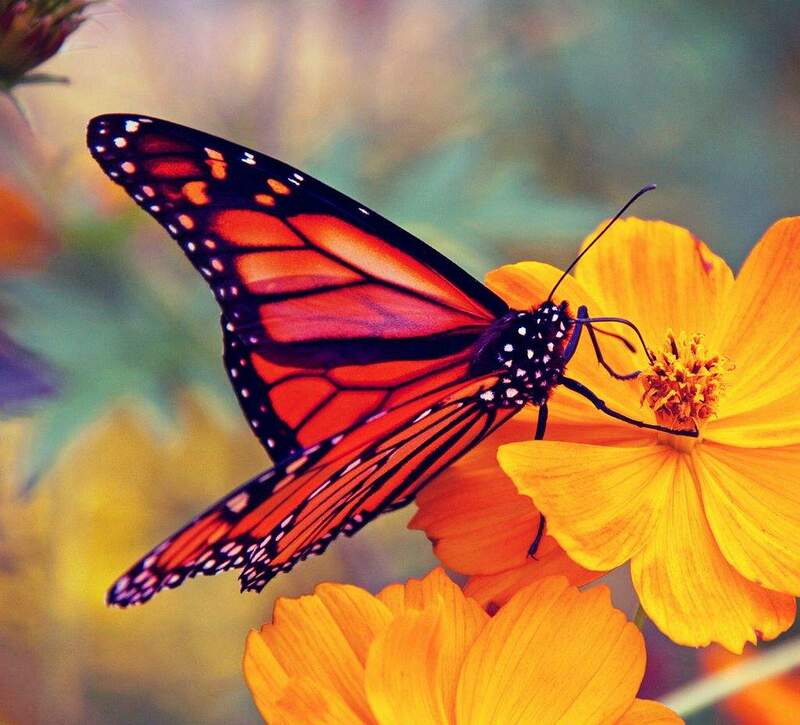 The Monarch butterfly is probably the most well-known species here in Ontario and one of the largest. Thanks to its extraordinary holiday plans it’s the best known of all the migratory butterflies and because its migration is one of the most amazing in the insect world it makes for a fascinating school science project. Like all butterflies it begins life as a tiny egg, laid by a female monarch on the underside of a milkweed leaf. The various species of milkweed are their sole food source. Monarchs born in early autumn are the ones that make the incredible journey to Mexico, flying distances of 50-80, sometimes even 125 miles per day. I know! Butterflies don’t seem built for speed and stamina do they? All that scatter-brained fluttering is deceiving. After travelling two thousand miles the monarchs reach their destination in early November: thirty tiny overwintering sites in a small area of the Transverse Neovolcanic Belt of Mexico. All the sites are in fir forests, where the butterflies pass the winter hanging on the trees in such numbers that they sometimes break large branches by their weight. A vast blanket of millions of flashing, fluttering orange and black wings, they congregate as many as 20,000 to a single branch. A colony can contain up to six million monarchs per acre and the sight and sound of millions of monarchs together is one of the wonders of the world. They stay in Mexico until March (just like my neighbor, lucky duck), then they begin the long journey north. 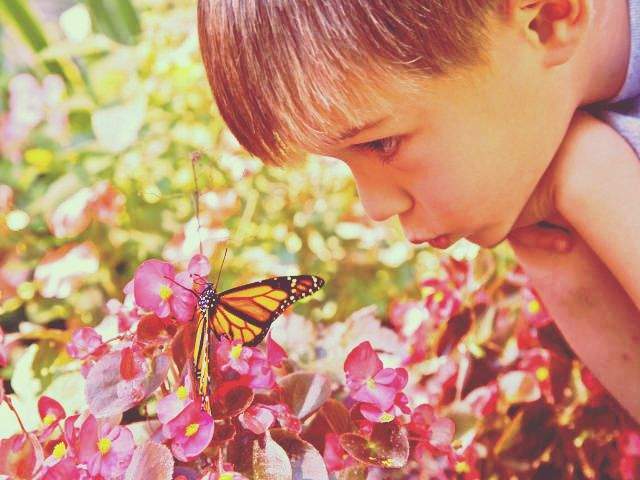 The monarch that left Canada will never make it back home, but it’s great-great-great-grandchild will, and will very likely rest at some of the exact same spots where monarchs flying to Mexico rested months before. Monarchs that make the journey to Mexico astonishingly can live up to eight months or more; the spring and summer generations live the usual butterfly life-span – between four and six weeks. Butterfly vacation day was warm and sunny – perfect conditions for parents joining the children in waving the butterflies off on their journey from Canadian classroom to South American fir forest. As classes lined up outside, it was evident a lot of work went into preparing for this special day: some children had made insect head-dresses, others wore wings. Their teachers carried the butterflies who hung contentedly from the mesh walls of their rather luxurious looking rearing containers. One by one the resident butterfly from each class was introduced by name (Fuzzy, Rainbow, and Kevin are the ones I remember) and released under the rapt gaze of two small ambassadors with outstretched index fingers hope-soaked in sugar-water to encourage goodbyes before takeoff. What beautiful butterflies – I had no idea they lived so long – or flew so far! They are gorgeous – and who would have thought butterflies could fly so much in a day. Sounds like an amazing day! And butterflies are georgeous, no matter the species! beautiful… we’ve hatched painted lady butterfies a couple of times and the girls love it! What a beautiful sounding event! Aren’t butterflies amazing, travelling so far when we consider them so fragile. What a lot of interesting info, butterflies look gorgeous, a great way to teach children. Is that what they are called. we have loads of them here in Thailand. They are so common but so pretty. I’ve taken a few pics myself. These are so beautiful! I have to admit I’m a bit nervous of big butterflies, but these look positively gentle. Beautiful and fab images. i adore butterflies they are natures pretties I think.